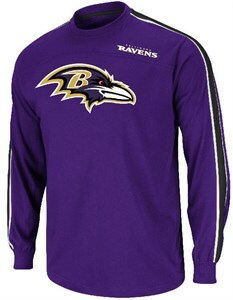 Football is here so show off your favorite NFL team colors in this Baltimore Ravens Long Sleeve Shirt by VF Imagewear. The End of Line 5 Fashion Long Sleeve Tee Shirt for men comes in Purple with a regular-fit body for a great fit and to show off your Ravens pride this NFL top features full-front Sueded Specialty Ink screened Ravens Graphics. Other features include color contrasting team piping on the shoulders and sleeves, color contrasting neck taping, a front yoke detail, a 5.2 oz. 100% Cotton body, and ribbing on the cuffs.